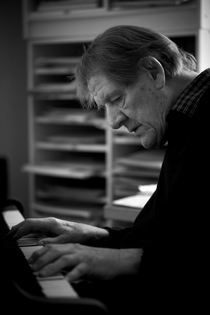 Considering Per Nørgård the most prominent Danish composer after Carl Nielsen is hardly a matter of hype. The principal witness to this is his overwhelming musical oeuvre, a music of such originality and profundity of thought that it is unparalleled in new Nordic music. With his work distributed evenly throughout a wealth of musical genres, from symphonies, operas and chamber music to film and theatre music, Per Nørgård's production is a highly personal travel document based on his endless incursions and excursions through the sonic labyrinths of this world. A world which to Nørgård is not just a confusing conglomeration of events, of chaos and irradicable suffering, but also an enchanted place, full of things to discover if you keep your mind and your senses wide open: the unending variety in nature, the endless connections between things, and not least the infinitely complex universe represented by any sound, no matter how modest. He is, in more than one sense, the traveller in Danish music and his travels have taken him far, so far, in fact, that he may appear to have travelled purely at random. The homely young Nørgård who took shelter from modern chaos in what he termed ‘the universe of the Nordic mind’ may be difficult to recognise in the kaleidoscopic and ambiguous Nørgård of the sixties. Or again in the beauty-searching metaphysician of the seventies or in the expressionistic researcher of the eighties. But by choosing the right focus you will not fail to see that the whole is saturated by the same interests; all the travels have in fact been one and the same journey.